Christina Fernandez, Hollywood Boulevard west of Bronson Avenue, Los Angeles, February-March 2010. Part of "How Many Billboards? Art in Stead" temporary project organized by the MAK Center for Art and Architecture. 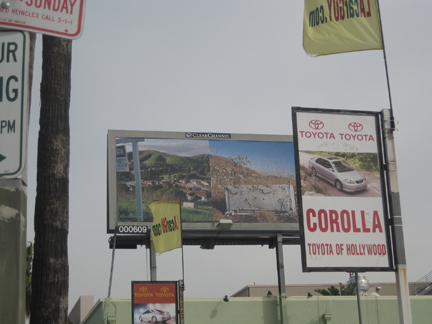 "Coldwell Couch, fuses two square-format photographs from her recent series Serano, capturing two distinct vantage points onto the characteristically Los Angeleno geography of an El Sereno neighborhood. Taken at the same site ten months apart, the two sides of the diptych are a complex meditation on our present socio-economic condition. In the left-hand photograph, a post displaying a Coldwell Banker Brokerage sign cuts across the foreground of the frame while, from a distance, an overturned loveseat echoes the shapes of houses sunk into a lush ravine of natural and cultivated vegetation." 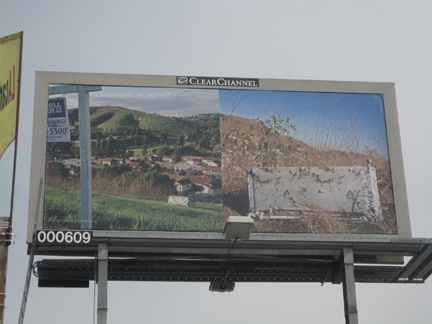 - text from a longer description by Nizan Shaked, http://www.howmanybillboards.org/, accessed 03/2010.